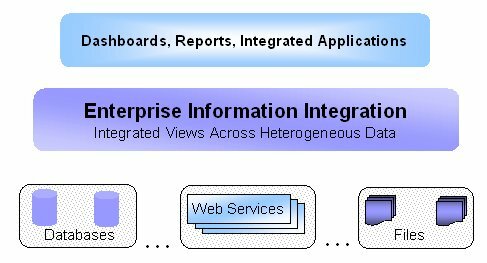 Enterprise Information Integration, otherwise known by the acronym EII, refers to the ability of software to access data from multiple and perhaps incompatible sources using a single interface, in most cases custom written for the organizational needs, and which may include more display methods than a simple database query allows, for example graphical representation of data. The goal of enterprise information integration is to present the data homogeneously such that the user is not aware of the actual sources of the information, and thru presenting the data in this manner make for more efficient use of reports instead of wasted time whilst the user manipulates the data for the task at hand. By extracting information from multiple sources and bringing it all together into a single interface it is possible to offer more information than a standard report, for example extracting sales data from accounts and merging this with data from the customer relationship manager and field testing from marketing to produce accurate sales by demographic. Ever since private enterprise came into being with the first human settlements, business people and their modern enterprise counterparts have been desperate for more information, a situation that computing power has only partially satisfied, although modern search result algorithms are proving that information integration isn’t impossible. Problems arising from the quest for enterprise information integration mostly stem from older or proprietary software that is by nature not intended to be used outside of it’s original interface. Older software in particular may not even provide methods of accessing the date from an API resulting in interface rewrites or custom interfaces that understand the original database structure. Recent attempts to create an open framework for information integration on the world wide web have created the XML protocol, a vastly improved form over the original HTML standard, and which is now finding it’s way into the enterprise thru recent software that uses XML formatted documents to store data from spreadsheets, databases, and documents allowing them to be accessible regardless of operating system or platform. Most efforts at enterprise information integration in major corporates have to date been conducted in piecemeal style, most often instituted at local or departmental level according to a specific need, and without regard for standards that would allow the wider userbase to benefit. Sadly this has the effect of making it even more of a challenge when EII is implemented corporation wide because additional data sources have to be supported. A further impediment to EII comes from the lack of compatibility between structured (database/spreadsheet) and unstructured (document/slideshow) data, and the inability of staff to find the information anyway once it has been brought together. Corporate intranets go someway to addressing enterprise information integration, and modern search algorithms improve this, nevertheless, getting structured data into an unstructured document such as marketing brief or business plan is still only possible with human intervention or the creation of templates. Until enterprise information integration strategies and software improve, many corporations will continue to rely on the services of data resellers such as market research firms, but the day is quickly approaching when this may no longer be necessary, at least that’s the promise of EII.